The chaos surrounding WVU basketball coaching changes has kept me from posting about the opening week of baseball season, but it has started VERY well for the Braves. Atlanta won two games in extra innings and completed a 3-game sweep of division rival Philadelphia. This marks the first time since 1994 that Atlanta has begun the season 3-0. I especially enjoyed the way Atlanta's pitchers went right after Ryan Howard in a dominating fashion. Mike Gonzalez looked fearless when facing Howard in a close match-up on Monday. Now, it's time to face the Mets and an epic match-up on Saturday between former teammates John Smoltz vs. Tom Glavine. 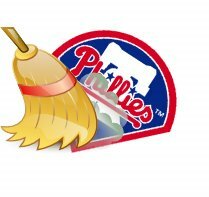 Maybe those Braves brooms can sweep the Mets like they did the Phillies. Starting the season like 1982 isn't too much to ask, right?